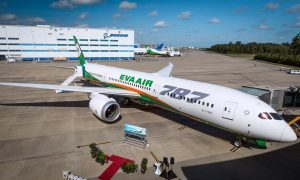 Boeing and EVA Air celebrated the unveiling of the airline’s new livery during a delivery ceremony for the carrier’s 22nd 777-300ER (Extended Range). This delivery is also the first of four 777’s to be leased from Air Lease Corporation (ALC) to EVA. The carrier is expected to grow its partnership with ALC as it continues to expand its long-haul fleet. 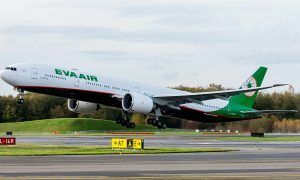 EVA’s new corporate identity retains its original compass design, borrowed from the logo of its parent company, Evergreen Group, which symbolizes the airline’s seamless network and services. 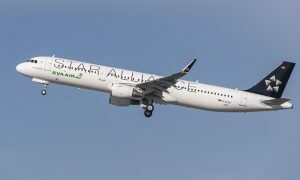 In the livery, the simplified tail design establishes the compass as the focal point for the EVA Air brand and represents the carrier’s commitment to quality service and flight safety. EVA Air currently operates more than 36 Boeing airplanes, including 21 777-300ERs. The airline plans to introduce seven more 777-300ERs to its fleet by the end of 2016 and deploy them on North American routes.